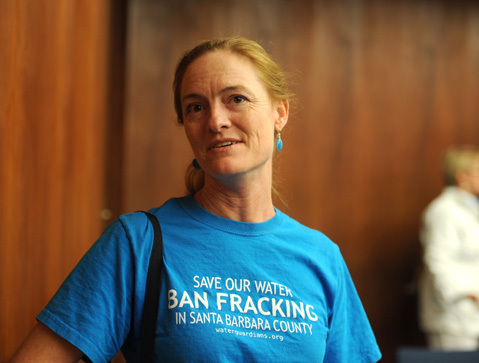 <b>SAME STANDARD:</b> Katie Davis of the Santa Barbara Sierra Club questioned if car owners are expected to be smogged, why should oil companies get a pass? In an effort to address the perils of climate change, the county supervisors voted 3-2 to adopt the most stringent greenhouse-gas-emission restrictions of any county in California, requiring all industrial facilities to limit their emissions to 1,000 metric tons a year or to offset any releases above that. The new rules will affect 50 industrial producers, all but one of which is an oil operation located in northern Santa Barbara County. Advocates for the oil industry had lobbied loud and hard for thresholds of 10,000 metric tons a year, arguing that new restrictions would damage the one North County industry to provide decent-paying jobs. According to county energy staff, the new regulations will capture 99.2 percent of the greenhouse gases released in the county by stationary sources. Under the 10,000 metric ton threshold, the capture rate would have been 90.4 percent. These numbers, however, are somewhat distant if not hypothetical. The companies involved will continue producing and generating pollution, but they will have to purchase pollution offsets and credits. Since none of these offsets currently exist in Santa Barbara County, the affected oil companies will purchase credits available in states like Alabama and Texas. While environmentalists concede Santa Barbara should have its own offsets, they also argue that because climate change is a global problem, anything that reduces greenhouse-gas emissions anywhere is a good thing everywhere. Santa Barbara, they argued, had an obligation to do its part to solve the problem, no matter how small its contribution might be. “Sometimes incentives are not enough to get us where we need to go in the time we need to get there,” said Supervisor Doreen Farr. At the meeting, oil-industry representatives had an air of resignation, and while some environmentalists argued in favor of a “net-zero” threshold, none pushed that hard. Driving this is AB 32, California’s landmark climate-change bill signed into law by Governor Arnold Schwarzenegger in 2006. That bill required California to reduce greenhouse-gas emissions to 1990 levels by the year 2020. While that goal appears to be well within reach, Schwarzenegger also required that the state reduce such emissions to 80 percent below 1990 levels by the year 2050. That goal is not so easily attained, and to meet it, local agencies will have to dramatically increase their rate of decrease. Adding urgency, Governor Jerry Brown just issued a new interim edict two weeks ago, requiring the state to reduce emissions to 40 percent of 1990 levels by the year 2030. With these new goals in mind, the supervisorial majority questioned whether the “business as usual” approach favored by the oil industry and a plurality of the Air Pollution Control District board ​— ​dominated by North County representatives ​— ​could achieve such reductions. Katie Davis of the Santa Barbara Sierra Club said that fully 77 percent of the population agreed greenhouse-gas emissions needed to be cut back, and she noted that the 10,000-metric-ton threshold was the equivalent of 2,000 new cars on the county roads. If all car owners are expected to be smogged, she argued, why should the oil company be given a pass for 2,000 cars’ worth?